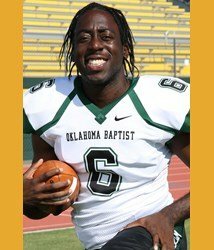 With a little more than six months to go before the 2016 NFL Draft and pro days Oklahoma Baptist University dual- threat quarterback Ernest Owens is working out twice a day as he prepares to impress the league and make the jump to the NFL. At 6-foot-2 and 180 lbs. with a 4.3 40-yard dash time and a 40-inch vertical leap, Owens has drawn comparisons to Minnesota Vikings QB Teddy Bridgewater. He is currently conditioning with twice daily weightlifting and runs. Owens, an Arlington, Virginia, native, had a standout prep career. He was a four-year starter in football, basketball, baseball and track and field at Duval High School. During his senior year he threw for 1,000 yards, rushed for 200 yards and threw 17 touchdowns. He was honored by the Washington Post as the most improved player in all of Maryland, Virginia and Washington, D.C. high schools. In addition, he graduated with a 3.83 GPA. Owens had numerous options when it came to choosing a college football program. He was recruited by Arkansas, Memphis, Wingate, Virginia Tech, Maryland, Baylor and Texas Tech, but chose to sign instead with Oklahoma Baptist University. Another reason he chose the program was because it is in the midst of a major transition – moving up from the NAIA to NCAA Division II. The school joined the Great American Conference for the 2015 season, and for the first time is competing against NCAA schools. Owens said that he was excited by the opportunity the school’s transition to the NCAA provided, and that he hopes to lead the young team to a bowl game while impressing the pro scouts. Also currently seeking an agent.